Sunrise Cappadocia Hot Air Balloon Flight for just 170 Euro per person. A not-to-be-missed once in a lifetime experience! Top off your visit to this fairytale-like area with a hot air balloon flight at sunrise. You'll drift high above Cappadocia's fairy chimneys and gain another perspective of Cappadocia's amazing landscape. There's no better way to start the day! Cappadocia with its fairy chimneys, valleys and mysterious-looking caves is one of the most popular destinations in the world for hot air balloon flights. 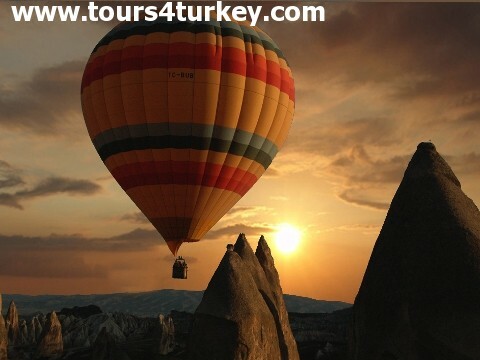 Tours4Turkey Travel is proud to offer the best prices for Hot Air Balloon Flights in Cappadocia. Your unique experience begins when you are picked up from your hotel early in the morning, then taken to the launch site where you will enjoy a cup of tea or coffee while you watch the spectacular sight of your balloon inflating as you meet our friendly crew. You’ll then float up to watch the sun rise as you drift over tDuring the flight you will have an unobstructed, 360 degree view of this beautiful and unique landscape, so you will have the opportunity to take lots of quality photographs. Our ground crew follow your flight on the ground, and on landing will be there to help you disembark from the basket. Upon landing, you will enjoy a glass of champagne to celebrate your experience, and you will receive a commemorative flight certificate. We’ll then drop you back to your hotel with plenty of time to go on your day tour or catch a bus to your next destination. Please note that children under the age of 6 years are not permitted to take a Cappadocia hot air balloon flight for safety reasons. Offering you the best balloon flight in Cappadocia with the best prices all year round. Feel free to contact us if you wish to book a Hot Air Balloon Flight in Cappadocia.